Has Edible Landscaping Gone Greedy? Edible landscaping is a trend that’s gained traction over the past decade with many home gardeners. Its popularity can be attributed to spiraling produce prices and shrinking property sizes. Selecting plants that achieve edible produce, rewards gardeners who opt to use their limited space. Rather than plant non-producing ornamentals, gardeners are making proactive, edible choices. Why Has Edible Landscaping Become Too Greedy? According to Christopher Weber’s article In a hungry world, should edible landscaping do more? we’ve become self-sufficient to the point that “self” is the only one gratified by this practice. Surely we can find a way to solve one of the world’s worst social problems? Our hungriest citizens can be easily provided for. The amount of food that we produce is enormous. There’s heaps we can do to solve some of these issues from a home gardener perspective. The question is, are we prepared to make the sacrifice – if it is a sacrifice at all? Donate the surplus crops to your local food bank or homeless shelter. Most of our edible plants produce all at once meaning that the fruit is often wasted. 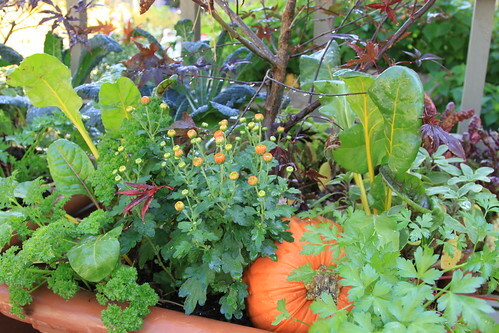 Create a Street-Side Veggie Patch where others can help themselves to the fresh produce. This is the freshest way to offer an ongoing solution, but may create other problems with unwanted visitors and vandals. Petition your local government and businesses to use their gardens as edible landscaping opportunities. Pouring large amounts of money into tending ornamental shrines does not make sense. Participate in the Plant a Row for the Hungry program and opt for staples such as potatoes, sweet potatoes, turnips and swedes. In the same vein, why not plant a fruit tree primarily for the hungry. Even a dwarf variety will offer some produce for those in need. Join, or start, a community garden with the aim to produce fruit and vegetables for the poor and needy. Most local governments would be only to happy to give land for this purpose. Edible landscaping can easily challenge such insurmountable problems such as world hunger. It’s not rocket science. All it takes is a shift in our thinking to harness our expertise and make the world a better place. If you’ve been involved with gardening to solve hunger in your area, let us know what you did and your experiences. It may give all us gardeners to shove along we need. Many of my clients utilize herbs, fruit trees and bushes for landscaping. Locally there are a number of beautiful community gardens that add to the landscape. This is a great idea thanks for sharing. I’ve even read about people in California grafting fruit branches onto public trees, which I thought was really interesting. That’s a brilliant idea. I’m guessing the purpose is to prolong the fruiting seasons and provide further varieties? And I think it’s really just a way to make use of public trees that otherwise might not supply food at all.